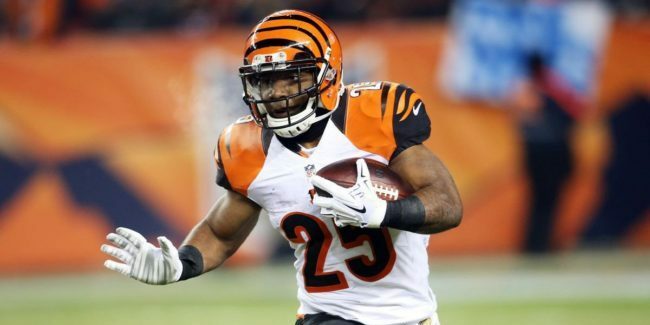 As I do every week over the last 6 years, I’m back to help with some waiver wire adds via my weekly Waiver Favors article! I’m assuming if you’re a returning reader, you won your fantasy football championship last year, so congratulations! Here are a couple suggestions after Week 2 of the 2018 fantasy football season. You’re welcome. Again. Giovanni Bernard has become a bit of an afterthought with the entire Jeremy Hill and now Joe Mixon thing in the backfield. But with Mixon out for 2 weeks due to injury, Bernard is likely to get a significant increase in touches. The Bengals offense has been clicking of late, so I’d say Bernard has some significant upside over the next 2 weeks. Need an RB rental in a 12-team or deeper league, feel free to pick him up. He’s also an important handcuff got all Joe Mixon owners. The Eagles had a tough week in terms of injuries and result. In particular, with Darren Sproles out with a hamstring injury, the last thing they needed with a Jay Ajayi back injury. Sure, he eventually came back but he missed about half the game. 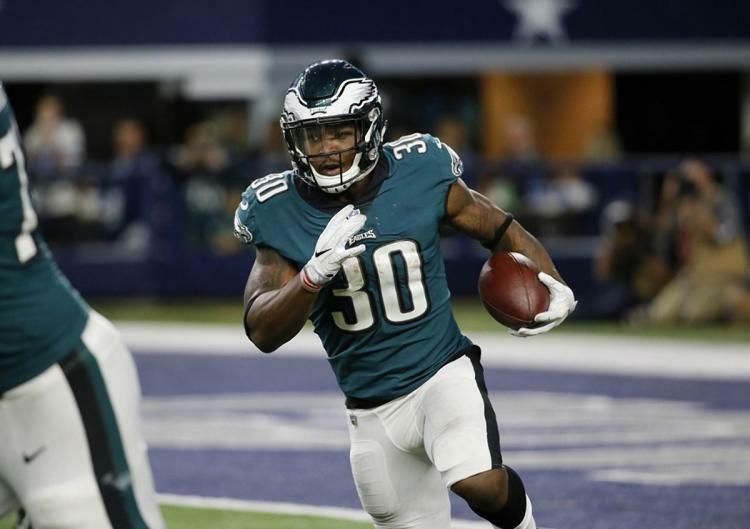 In stepped Corey Clement, who rushed six times for 30 yards and a TD and caught 5 of 6 targets for 55 yards. Not too bad. Sure, if both Ajayi and Sproles are healthy, he’ll likely be third on the depth chart for touches, but he’s proven he can be effective, and might even carve out a role with everyone healthy. Clement is worth a pick up by any any Ajayi or Sproles owners, or anyone who wants an upside stash in 12-team leagues or deeper. After the preseason injury to Marqise Lee, there were questions about who would lead the Jaguars receiving core. 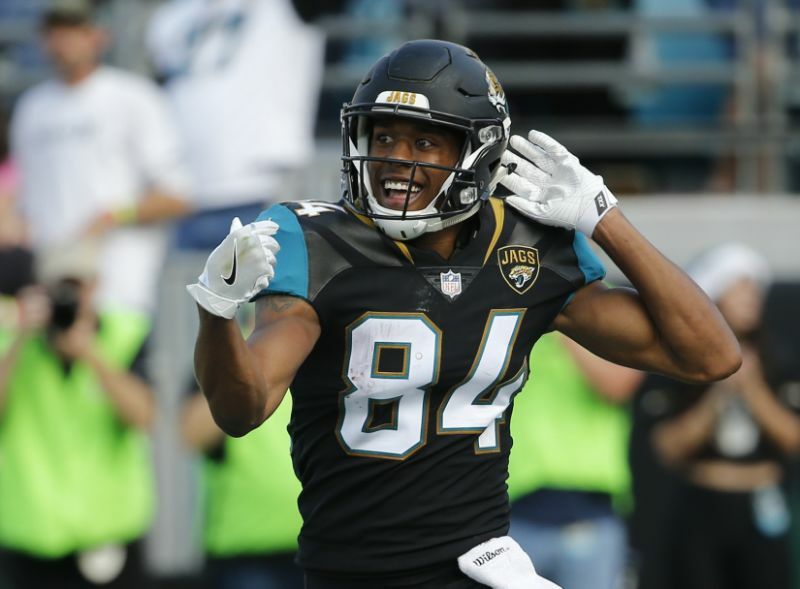 Keelan Cole was the front runner for post pundits, but Week 1 was messy, with Cole leading all WRs with 54 yards, but Dede Westbrook leading all WRs with 6 targets. 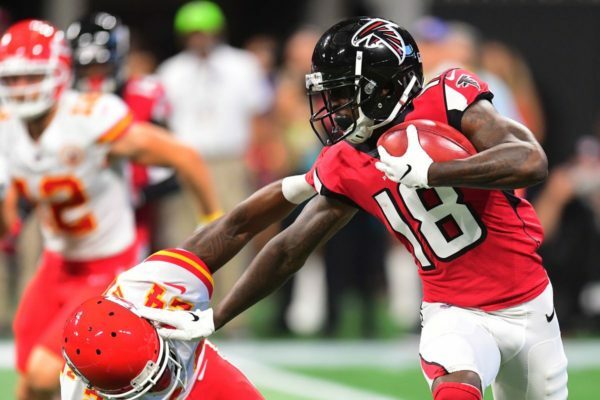 After Week 2, both appear ready to contribute, but Cole was the apparent WR1 when he caught 7 of 8 targets for 116 yards and a TD against the Patriots. It’s clear that Cole goes as Blake Bortles goes, but the Jaguars appear for real after starting 2-0 and soundly beating the current Super Bowl Champs, so this might be your last chance to grab him. 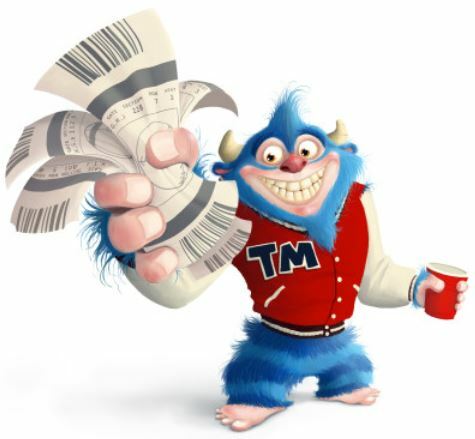 Make a claim in all 10-team leagues or deeper. And if you miss, feel free to take a look at Dede Westbrook (17% Owned) in all 12-team leagues or deeper. 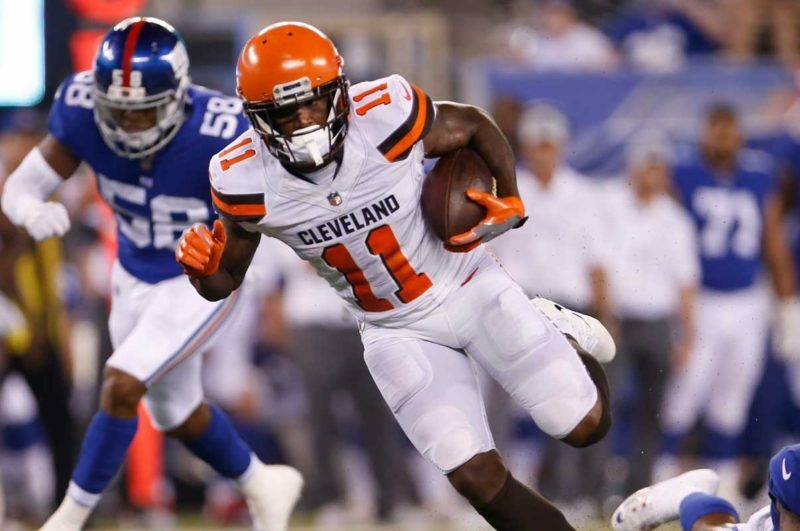 There was tons of hype about 4th round rookie Antonio Callaway in the preseason, but everyone knew that Josh Gordon would be back, and alongside Jarvis Landry and David Njoku, would absorb most of the Browns targets. But the Browns surprisingly decided to part ways with Josh Gordon, so guess who started opposite Landry? Yup, Antonio Callaway. And he didn’t disappoint catching three of four targets for 81 yards and a TD against the Saints. He also carried the ball twice for 7 yards. Of course, a lot of that production was a 47-yard TD near the end of the 4th quarter, but they all count the same. Rashard Higgens saw 3 more targets, but its clear that Callaway is the big play guy. Go get him in all 12-team leagues and deeper. So the lead here is FitzMagic going nuts AGAIN with 402 yards and 4 TDs. But as long as FitzMagic is on, his WRs are also in play. I recommended DeSean Jackson last week, and he’s still the preferred add, but if you missed on him, feel free to grab Chris Godwin. Godwin caught 5 of 6 targets for 56 yards and a TD, following up a 3 of 4 for 41 and TD performance in Week 1. 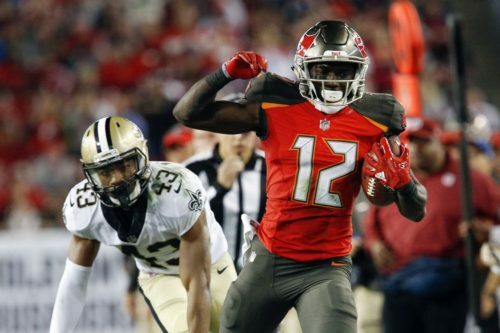 He’s definitely involved, and although he’ll likely stay behind Mike Evans and D-Jax, but he’s worth a chance as a WR4/5 or Flex in 12-team leagues or deeper. I was high on him in the early preseason, out on him as the season started and now cautiously back on again. I’m not saying you snag him everywhere, but we know the upside he has from college, and he finally had a meaningful contribution catching 4 of 5 targets for 64 yards and a TD against the Panthers. Only Julio Jones had more targets. He’s not going to be consistent, and perhaps some of this production is from Devonta Freeman’s absence, but he does have some upside stash appeal for those in 14-team leagues or deeper. Tyler Boyd didn’t have much in Week 1, but then the Bengals opened it up and it looks like he’s solidified the spot behind AJ Green by catching 6 of 9 targets for 91 yards and a TD over the surprisingly ineffective Ravens defense. 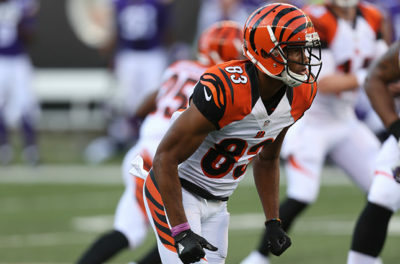 He was getting plenty of separation on his routes and looks to continue being an upside WR2 on the Bengals. That’s good enough for him to be a WR4/5 or Flex in 14-team leagues or deeper. There was some question as who would pick up the targets left behind by an injured Greg Olsen, and just about no one expected that person to be Jarius Wright. But here we are in Week 2 with Wright catching 5 of 7 targets for 62 yards and a TD, and now totaling 12 targets in 2 weeks. Perhaps it won’t last, but it’s worth some speculation in 16-team leagues and deeper for as long as Greg Olsen remains out. Look for UPDATEs for Sunday and Monday Night Football here! WRs – Kenny Golladay, Geronimo Allison, Ted Ginn Jr.